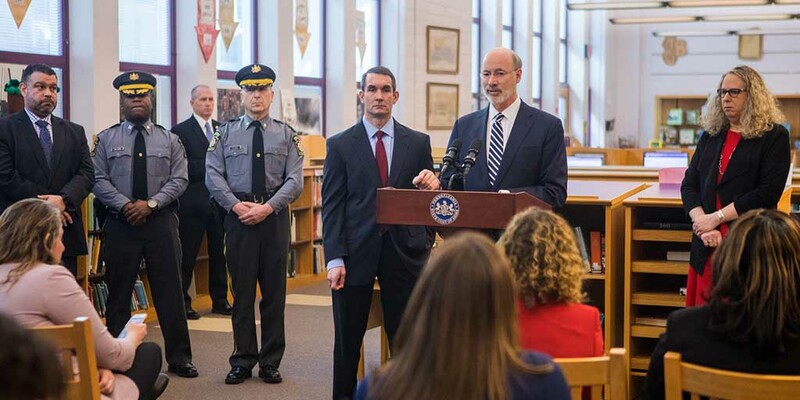 Harrisburg, PA – Governor Tom Wolf and Auditor General Eugene DePasquale today released the full report from the Pennsylvania School Safety Task Force created by Gov. Wolf and the Auditor General in March after the high school shooting in Parkland, Florida. The initial report findings were released in June after a review of the discussions at six regional task force meetings held from April through June, and the feedback provided via an online survey. The roundtable events were held to listen to students, parents, school officials, school nurses and other health care professionals, law enforcement, education organizations and community members about their ideas to improve safety and security. These themes are expanded upon in the report, including detailed recommendations on how the state, community and school officials should work collaboratively with each other and students and families to use all the tools at their disposal to prevent school-based violence from occurring. In addition to the task force report, Governor Wolf’s 2018-19 budget includes $60 million that will be distributed by a new School Safety and Security Committee with the Pennsylvania Commission on Crime and Delinquency to help school districts across the state address their unique school safety needs. The committee will award grants to school districts and other school entities for physical building upgrades, security equipment, teacher training, alternative education programs, community violence prevention programs, and special and individualized mentoring programs to keep teachers and students safe. Read more about the School Safety and Security Committee here. In addition to Governor Wolf and Auditor General DePasquale, members of the School Safety Task Force include vice-chairs Derin Myers, Acting Executive Director of the Pennsylvania Commission on Crime and Delinquency; Mark DiRocco, Executive Director of the Pennsylvania Association of School Administrators; Bonita Allen, President of the Pennsylvania Parent Teacher Association; Judy Morgitan, Immediate Past President of the Pennsylvania Association of School Nurses and Practitioners; and Dolores McCracken, President of the Pennsylvania State Education Association.